AULA BLOG lets policymakers’ own words characterize the state of relations between Washington and Caracas. The government of the United States should take responsibility, before the Venezuelan people and the world, for allowing U.S. institutions and individuals to finance, legitimize and promote the actions of persons and groups who attack Venezuelan society violently, and who look to twist the democratically expressed will of our people to build their sovereign destiny in peace. The Bolivarian Republic of Venezuela forcefully rejects the statements made today, Wednesday, February 19, by the President of the United States, Barack Obama, insofar as they constitute new and crude interference in the internal affairs of our country, made worse by being based on false information and baseless accusations. This is an offense to the heroic land of the Aztecs, of Juárez, of Villa, and of Zapata; to the noble and courageous people of Mexico, the sister nation from which President Obama continues attacking a free and sovereign nation of Latin America and the Caribbean because its policies, principles, and decisions are the result the democratic expression of popular will. The statement that the independent governments and people of the world await is that in which the government of the United States of America explains why it finances, encourages, and defends opposition leaders who promote violence in our country, and clears up what right Deputy Assistant Secretary [of State] Alex Lee has in sending a message from his government that tries to impose conditions on and threaten the Venezuelan state for having taken judicial action against those responsible for the violent acts of recent days. As a final point, the Venezuelan government reiterates that it will continue monitoring and taking the necessary actions to prevent U.S. agents attempting to cause violence and destabilization, and informs the world of the nature of the interventionist policies of the Obama administration in our country. I have just read recent statements by John Kerry – arrogant, interventionist and insolent – that confirm the terms of the threat that I denounced. John Kerry is threatening Venezuela with more violence through his statements giving the green light to violent groups to attack our people. Let the brutal and insolent imperialists know that we will continue defeating it with the force of our people, which is the force of Bolívar and Chávez. I call for a dialogue with you, President Obama. I call for a dialogue between the patriotic and revolutionary Venezuela and the United States and its government. Accept the challenge. Let’s initiate a high-level dialogue and let’s put the truth out on the table. … I say this, and some will say, ‘Maduro is naïve.’ No, we will always find a new situation through political dialogue – a change in the historic relations between the U.S. elite and Latin America and Venezuela. … I propose therefore a grand dialogue, and that we name ambassadors, since they haven’t been accepted so far, so they can sit down and talk. There’s a global campaign against Venezuela. 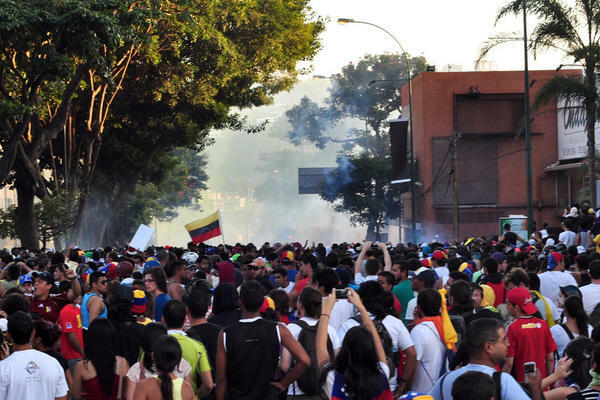 It’s a campaign to justify an intervention in the domestic affairs of Venezuela. … [There is] a brutal manipulation campaign, [which] has created a perception in the world that Venezuela is on the verge of civil war, that here in Venezuela we have a group of docile students opposing an illegitimate government. In general, when it comes to Venezuela, we’ve made clear that we’re open to having a constructive relationship with the Government of Venezuela. Quite frankly, we haven’t seen that – we have not seen that reciprocated, to be clear. So we also, I think, see a lot of conspiracy theories or rumors out there in the press about how the U.S. is interested in influencing the domestic political situation in Venezuela, which is absolutely not true. It’s not up to us to comment on internal Venezuelan politics. So we are deeply concerned by rising tensions, by the violence surrounding these February 12th protests, and by the issuance of a warrant for the arrest of opposition leader Leopoldo Lopez. We join the Secretary General of the OAS in condemning the violence and calling on authorities to investigate and bring to justice those responsible for the deaths of peaceful protestors. We also call on the Venezuelan Government to release the 19 detained protestors and urge all parties to work to restore calm and refrain from violence. The United States is deeply concerned by rising tensions and violence surrounding this week’s protests in Venezuela. Our condolences go to the families of those killed as a result of this tragic violence. We are particularly alarmed by reports that the Venezuelan government has arrested or detained scores of anti-government protestors and issued an arrest warrant for opposition leader Leopoldo Lopez. These actions have a chilling effect on citizens’ rights to express their grievances peacefully. We join the UN High Commissioner for Human Rights, Secretary General of the Organization of American States, EU High Representative for Foreign Affairs, and others in condemning this senseless violence. We call on the Venezuelan government to provide the political space necessary for meaningful dialogue with the Venezuelan people and to release detained protestors. We urge all parties to work to restore calm and refrain from violence. Freedoms of expression and peaceful assembly are universal human rights. They are essential to a functioning democracy, and the Venezuelan government has an obligation to protect these fundamental freedoms and the safety of its citizens. The allegations that the United States is helping to organize protestors in Venezuela is baseless and false. We support human rights and fundamental freedoms – including freedom of expression and of peaceful assembly – in Venezuela as we do in countries around the world. But as we have long said, Venezuela’s political future is for the Venezuelan people to decide. We urge their government to engage all parties in meaningful dialogue. We have seen many times that the Venezuelan Government tries to distract from its own actions by blaming the United States or other members of the international community for events inside Venezuela. These efforts reflect a lack of seriousness on the part of the Venezuelan Government to deal with the grave situation it faces. … With the OAS and our regional partners, we are working to urge calm and encourage a genuine dialogue among all Venezuelans. There is no room for violence by either side. In Venezuela, rather than trying to distract from its own failings by making up false accusations against diplomats from the United States, the government ought to focus on addressing the legitimate grievances of the Venezuelan people. So, along with the Organization of American States, we call on the Venezuelan government to release protestors that it’s detained and engage in real dialogue. And all parties have an obligation to work together to restrain violence and restore calm.